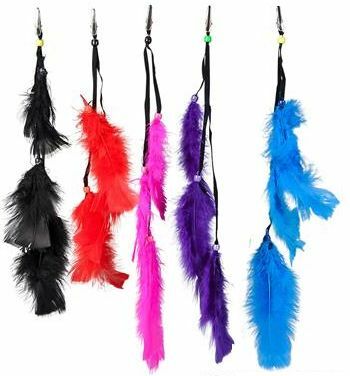 These feather clips are great sellers at pow wows, bike rallies, and hippie events. 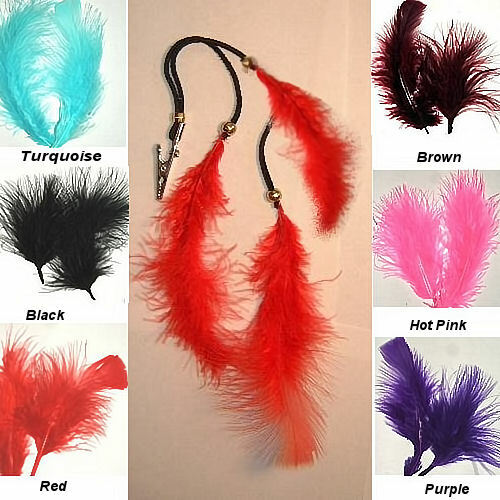 This feather clip has three brightly colored dyed turkey fluff feathers attached to an alligator clip with a double leather streamer and wood beads. Great to wear in your hair for a 70s look or with your pow wow regalia. Clip it on a hat or purse, or attach them to your horse's bridle or your car's rear view mirror. Hand them out for party favors or use them for stocking stuffers at Christmas or on your easter baskets for a colorful flair. Great impulse item. Overall length is about 13 to 14 inches (33.02cm). Available in assorted colors such as black, red, hot pink, purple, turquoise, and green. If you have a color preference, we will try to accomodate you, but not all colors are in stock all the time. You can give alternate color requests by leaving a comment in the comment box of your checkout form.